Updates are still ongoing as of 05Jan16, but all the main pages should now be working. Norman Geras, the main author of the Euston Manifesto died in Cambridge, England on 18th October 2013. A Website archiving tributes to Norm and his blogging is at normfest.org. New additions to this archive are posted by the Twitter feed @normfest. 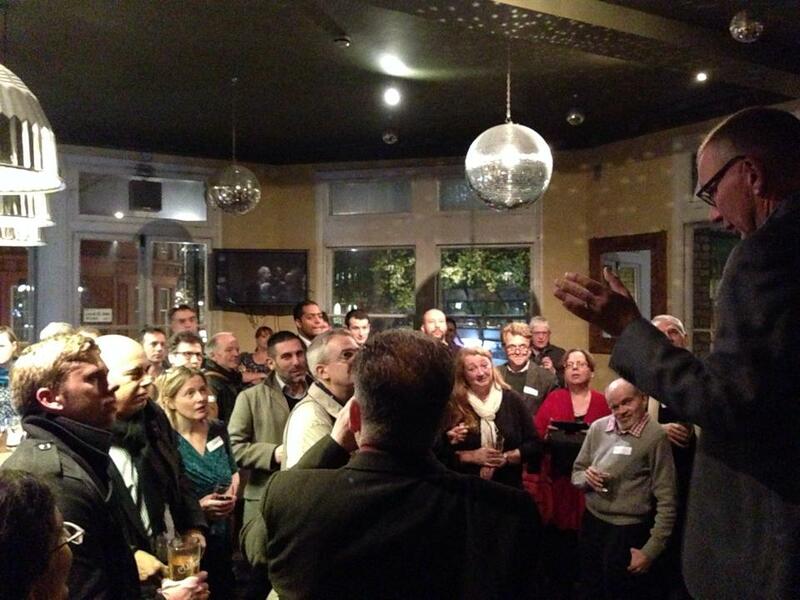 A meeting was held in his honour in London on 27th November 2013, at which this photo of Nick Cohen speaking to some of the 100 or so attendees was taken by Euston Manifesto Group member Anthony Cox. Norman Geras summarizes some opinion on the legality and morality of the action. At conservative blog Ricochet.com, Claire Berlinski lists some of Bin Laden’s victims. On Slate, Christopher Hitchens treats the opinionating of Noam Chomsky on the matter with the contempt it deserves. At the Website of he New Republic tries to put the event in historical perspective. Eustonite blogger Mick Hartley takes issue with at least one aspect of the article by Michael Koplow that I linked to previously, as well as linking to Christopher Hitchens’ 2007 and 2011 commentaries on the political situation in Tunisia. Both the BBC and Channel 4 ask “the domino question”. The theory goes that private US diplomatic cables from the Tunis embassy released via Wikileaks on December 7 revealed to Tunisians that Ben Ali was an authoritarian despot, that his family was supremely corrupt, and that life was crushingly hard for the Tunisian poor and unemployed, spurring them to take to the streets. It goes without saying that Tunisian’s were well aware of this and more, and that the spark for weeks of street protests and riots that rolled across Tunisia (and, indeed, are still rolling) was the suicide of a desperate young man in mid-December. Interestingly, in doing so, he finds fault with an article on the Foreign Policy Website, and he is careful to reserve judgement on whether or not the recent dramatic changes in Tunisia are truly revolutionary. The spark for the Tunisian uprising (I’m reluctant to call it a "revolution" since it certainly isn’t clear, as Tunisians are kept inside tonight by a harshly enforced military curfew, that the established order will be replaced) was the spectacular self-immolation of Mohammed Bouazizi in Sidi Bouzid on December 18. Mr. Bouazizi, a 26-year-old computer science university graduate who couldn’t find a job in his field and had been reduced to selling fruits and vegetables on the street, set himself on fire Dec. 18 after police confiscated his little stand. The official reason was that he didn’t have a permit, but I’d bet the real reason was the he failed to pay a bribe. Unlike in Egypt, Jordan, Algeria, and most other secular Arab autocracies, the main challenge to the Tunisian regime has not come from Islamist opposition but from secular intellectuals, lawyers, and trade unionists. The absence of a strong Islamist presence is the result of an aggressive attempt by successive Tunisian regimes, dating back over a half-century, to eliminate Islamists from public life. Ben Ali enthusiastically took up this policy in the early 1990s, putting hundreds of members of the al-Nahda party, Tunisia’s main Islamist movement, on trial amid widespread allegations of torture and sentencing party leaders to life imprisonment or exile. Most influential Tunisian Islamists now live abroad, while those who remain in Tunisia have been forced to form a coalition with unlikely secular and communist bedfellows. The weakness of Tunisia’s Islamist opposition also makes it difficult to forecast how other Middle Eastern regimes would react to similar protests. It is unthinkable, for example, that Mubarak would not choose to crack down more viciously on protesters given the very real possibility that, if overthrown, Egypt would become an Islamist state. Given the unique nature of Tunisian society, observers hoping that Ben Ali’s fall will portend a similar fate for other Arab autocrats may be left waiting a lot longer than they might now think. ONE of the many things that irritate me is people putting themselves forward as self-appointed “spokesmen”, claiming to speak on behalf of enormous masses of other people. Examples are everywhere: the Board of Deputies of British Jews, for instance, proudly calls itself “The Voice of British Jewry,” as if it’s possible for a 350,000-strong grouping that includes the Marxist historian Eric Hobsbawm and the caricature capitalist Sir Alan Sugar to speak with one voice on anything much. The Confederation of British Industry claims to be the “Voice of Business”, as if businessmen were some kind of communal, ant-like hive mind (aren’t they meant to be competing with each other, not cooperating?) Usually, the best we can hope to hear from such outfits is the views of the majority of those who could be bothered to join up. One particularly striking example is the Taxpayers’ Alliance (TPA), which agitates for cutting government waste, lowering taxes and shrinking the state. It’s effective, too: it boasts of scoring over a dozen media mentions a day; some of its advisors have close links with the governing Conservatives. But the name “Taxpayers’ Alliance” is misleading, since it implies that the TPA is speaking for virtually everyone in Britain (since almost everybody pays some tax or other). Okay, few people would support government waste. But there are plenty who don’t like the idea of shrinking the state, including, I would guess, many of the 8.6m who voted Labour at the last election. Were I a cynic, I might suggest that the TPA’s name is designed to make it sound like some kind of grassroots movement standing up for the ordinary, honest citizen (indeed one of the TPA’s aims is, apparently, to “give taxpayers a voice in the corridors of power”). In fact, of course, it is nothing of the sort: it claims 20,000 members, or 0.03% of the total number of taxpayers in this country. The TPA says that its aim is not to represent the views of all taxpayers—that would be impossible, of course—but to represent their collective “interests”. But again, this is rather disingenuous, since what a rich property magnate with a second home in the Carribbean thinks is in his interests is unlikely to be what an unemployed single mother on a Glasgow estate thinks is in hers. It’s like the attempt we recently noted to call Republican anti-tax activists “taxpayer protectors”. As if “channeling” this none-too-subtle identification of Chavez with the national hero, Venezuelan television was compelled to run images of Bolivar, followed by footage of the remains, and then pictures of the boss. The national anthem provided the soundtrack. Not since North Korean media declared Kim Jong-il to be the reincarnation of Kim Il Sung has there been such a blatant attempt to create a necrocracy, or perhaps mausolocracy, in which a living claimant assumes the fleshly mantle of the departed. For years now, Mick Hartley’s blog has often linked to and summarized journalism that covers the horror and absurdity of life under the North Korean regime. Not only are its subjects prisoners, but the story of their suffering is hidden from the outside world, both by the paranoia and secrecy of the country’s rulers and by the indifference of many outside the country. After speaking recently to a group of young South Korean soldiers about North Korea’s harsh labor camps, former prisoner Jung Gyoung Il — himself once a soldier in North Korea’s massive army — was stunned by the questions from the audience. One soldier asked how many days of leave North Korean soldiers were given. Another asked if North Korean soldiers were allowed to visit their girlfriends. No one showed any curiosity about the notorious network of gulags, a signature marker of the North’s brutality toward its own people. In a rare acknowledgment, the South Korean government recently noted in a report that hundreds of thousands of North Koreans are languishing in the prison camps. But Seoul has made no public effort to exert pressure on Kim Jong Il’s regime over the issue. And many South Koreans, who hold deeply conflicted feelings toward their communist neighbor, are reluctant to even concede that the camps exist. At universities, Jung said, many students sleep through his lectures about North Korea’s gulags. The indifference still shocks him, five years after he defected to South Korea following three long years in the Yodok gulag characterized by back-breaking labor, a sparse diet and long nights of forced study of former dictator Kim Il Sung’s philosophies. But such apathy is typical in South Korea, where North Korea’s prison camps have rarely been discussed in public or in the political arena.